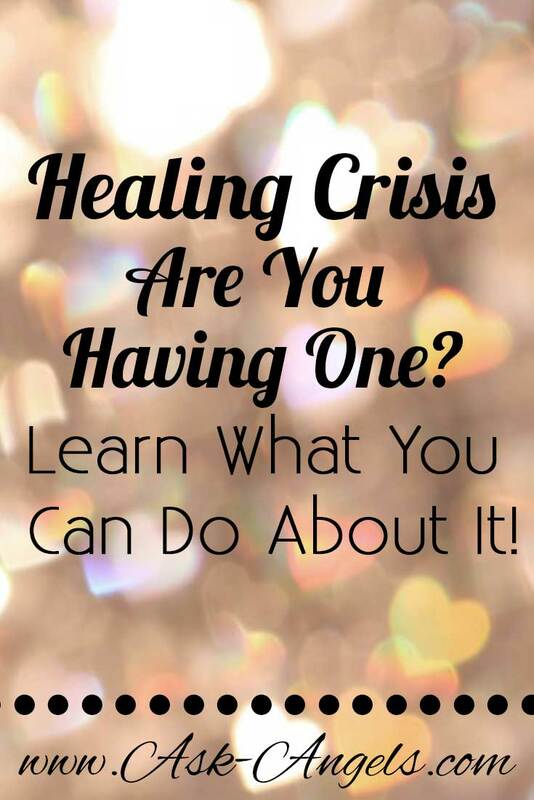 What’s a Healing Crisis - Are You Having One? “Energetic Purging” And Why You May Feel Worse After Healing Work. Your body is constantly changing – both cellularly and energetically. On a basic level, your body’s goal is to maintain stasis – even if some part or parts of you are currently unhealthy, your body will still try to maintain some sense of equilibrium around the unhealthy parts. The goal of energetic healing work is to remove stagnant and stuck energy that is holding you back and replace it with dynamic cleansed energy. When you do this, there’s going to be a significant shift in the balance that your body has worked hard to create and maintain. Healing body work includes all types of massage, Reiki, Chios, Angel Energy Healing, acupuncture, acupressure, crystal healing, pranic healing, channeling, aura cleansing, chakra cleansing, pranayama, and so much more. I’ve heard from numerous people who report that, against their expectations, they felt absolutely awful after a healing session. Typically their symptoms have mimicked the flu and only lasted one or two days, but there are some who feel exceptionally drained, both physically and emotionally. This can be incredibly discouraging and confusing if you don’t understand that this is actually exactly what you want! Energy gets stuck for a reason. Often it’s because you can’t or don’t want to face something difficult. Energy can also get stuck from trauma, crises, numbness, or denial. Some part of you, whether it’s your ego, your body wisdom, or your spirit wisdom, is trying to protect you. Rather than feeling everything in the moment and letting it pass through, thoughts and emotions (energy) gets stuffed down into your energetic corners, so to speak. Enough stuffing and you’ll have physical manifestations like pain and disease. It’s protection, and in the short term, it’s not a bad thing. Only when numbing and stuffing become a habit and your default coping method do you get into trouble. In the long run, this protection doesn’t serve you, but the body holds on to it thinking its helping. Healing work is usually about releasing the patterns of stuckness that no longer serve you. Something led you to healing work in the first place. If it's not acute or obvious illness, then maybe it's a feeling of your life being “off,” or something not feeling quite right. Whatever your reasons to begin healing work, the goal is generally to feel better, not worse. Any type of cleansing or healing that you do will come with a release. This can happen on a physical, mental, emotional, or spiritual level, and often happens on several levels simultaneously. When toxins and toxic energy are released, your body and mind have to deal with a sudden and powerful shift in balance. It’s impossible to have a release in any of your three bodies (physical, energetic, spiritual) and not have the other two affected. As I said, your body is good at maintaining stasis, so symptoms are usually mild. But symptoms are always unique depending on your sensitivity, your level of illness or disease, and your frame of mind during the session. This is often referred to as “The Healing Crisis.” You are releasing the old low energy and replacing it with new high energy. Your three bodies have to adjust because you’ve changed the stasis point. While each of your three bodies searches for new balance, you’re likely to experience uncomfortable symptoms. The Healing Crisis can be unpleasant and can even take you a while to identify as being a result of your healing session. But, it’s all a part of the process and essential, really, to true and complete healing. All that gunk you’re moving out? That’s your anger, hurt, broken heart, unhealed trauma, unspoken feelings, betrayal, rejection, and loss. You won’t be able to get all that moving again (in order to release) without feeling something. The stasis that your body was maintaining was based on all these feelings being stuck in your physical and energetic bodies. Your stasis point was, essentially, unhealthy. That’s why you felt “off” and sought healing work to begin with. When your stasis point is reset with that high vibrational and divine energy, your three bodies simply need time to adjust. Adjustment might take the form of crying, picking fights with loved ones, letting go of thoughts and feelings that held you back, fatigue, muscle ache, nausea, diarrhea, a common cold, inflammation, feeling the need to set a broken relationship straight, feeling heavy, vomiting, depression, anxiety, or a large emotional purge. If any of these symptoms occur in the days and weeks following a healing session, take heart; it’s a true sign of healing. It’s not that your practitioner did something wrong, it’s not that you did something wrong, and it’s certainly not that you’re destined to never feel good. When you experience a Healing Crisis means that things are moving as they should. The deeper and more intense the Healing Crisis, the deeper and more intense the healing. Drink extra water for a few days. This helps your physical body flush toxins and helps to keep everything circulating. Meditate in the evenings before bed. This will help your spiritual body by creating some extra space and some quiet within your busy mind. Get extra rest by going to bed a little earlier or letting yourself sleep in a little later. Don’t completely disrupt your routine, but by giving yourself some extra time, you’ll help your energetic body to relax and regenerate. Spend time journaling. Slow down and pay attention to what’s happening. So often, we believe that thinking is the best way to process and sort things, but writing is a much more effective tool to dig down to the deeper layers of our needs and desires. Put extra emphasis on a good diet and cut back on indulgences for a while. If your Healing Crisis was particularly strong, give yourself some time before the next session. If your symptoms were such that you’re feeling anxiety about repeating the experience, then take a break. It’s up to you and you know best. If you’re uncertain, consult with your practitioner and make a plan for continuation (or not) that feels good to you. When it comes to healing, going slowly is okay; don’t push yourself during this process. In fact, I recommend you enjoy it! This is you coming alive again! Learn more about how to cope with healing symptoms here! Thank you for writing this article, I needed to hear this as I could not for the life of me figure out why I kept getting sick the next day after a spiritual bath. It totally makes sense but felt like such a big phenomenon that I did not understand it completely until now. I totally believe in and lean on my Angels. Again, thank you! thank you for writing this article! you helped me understand and accept much easier what I am experiencing. be blessed!